I love my slow cooker. And I love when I can make simple and tasty dishes like this without requiring too much effort on my part. I was surprised by how easy pulled pork is to make. 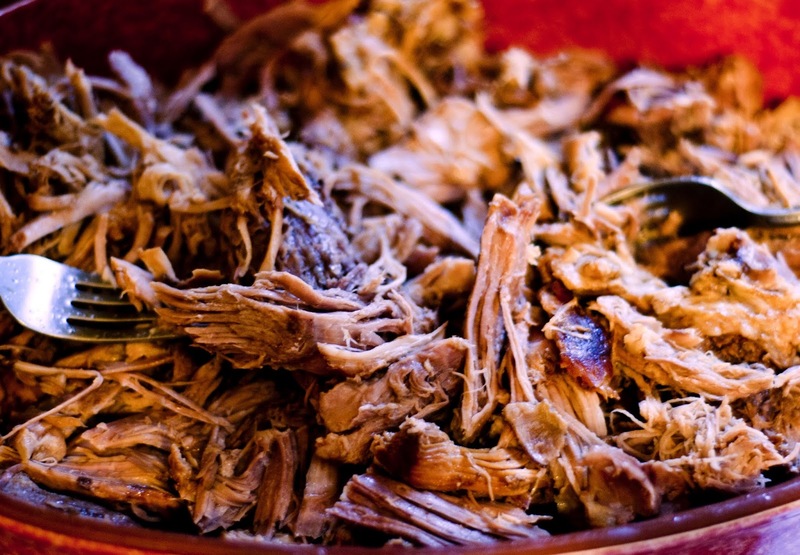 Throw a hunk of pork shoulder in the slow cooker with broth, onion, bbq sauce, salt, and pepper for 8 hours, and you've got pork so tender, it melts off the bone and into your mouth. I found so many wonderful recipes that I had a hard time choosing one, so I incorporated different elements from several of them (including Tyler Florence's Ultimate BBQ Sauce and Pioneer Woman's Spicy Dr. Pepper Shredded Pork). The end result came out nicely. I love the added texture and flavors the onions, garlic, thyme, and bacon give the bbq sauce. I would've loved to make this spicy and add the Chipotle peppers from Pioneer Woman's recipe but kept it mild for the kiddies. But if you're looking to keep it simple, no need for fancy bbq sauces. 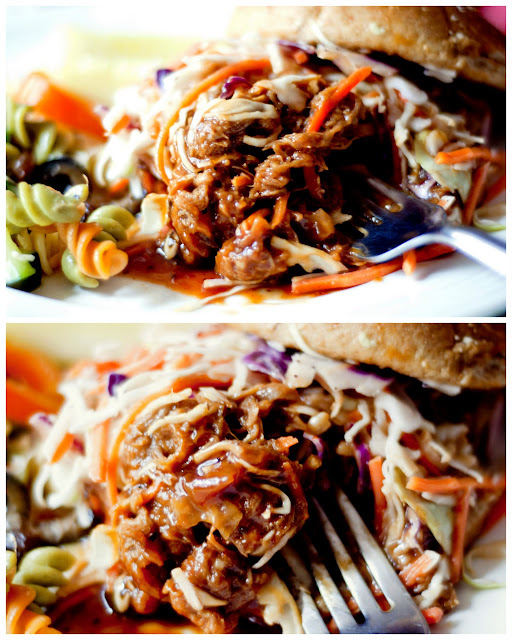 Here's a really easy recipe for pulled pork, and I'm sure it's just as good. Serve the finished product on hamburger buns topped with Wolfgang Puck's Apple Coleslaw, and you have yourself one delicious, melt-in-your-mouth pulled pork sandwich ready for your next barbecue. Trim excess fat from the pork shoulder. Layer onion on bottom of the slow cooker and place pork shoulder on top. Add water, broth, Dr. Pepper and 1 cup of homemade bbq sauce. Cover and cook on low until very tender, about 8 hours. Meanwhile, make the bbq sauce. Wrap the bacon around the bunch of thyme to create a bundle. Heat about 2 tablespoons of oil in a large saucepan over medium heat. Add the thyme and cook slowly for 3 to 4 minutes to render the bacon fat (this gives the sauce a nice smoky flavor). Add the onion and garlic and cook slowly without coloring for 5 minutes. Remove the thyme bundle from the sauce and add the store-bought bbq sauce, ketchup, dry mustard, cumin, and paprika. Stir over low heat and cook slowly for 20 minutes to meld the flavors. 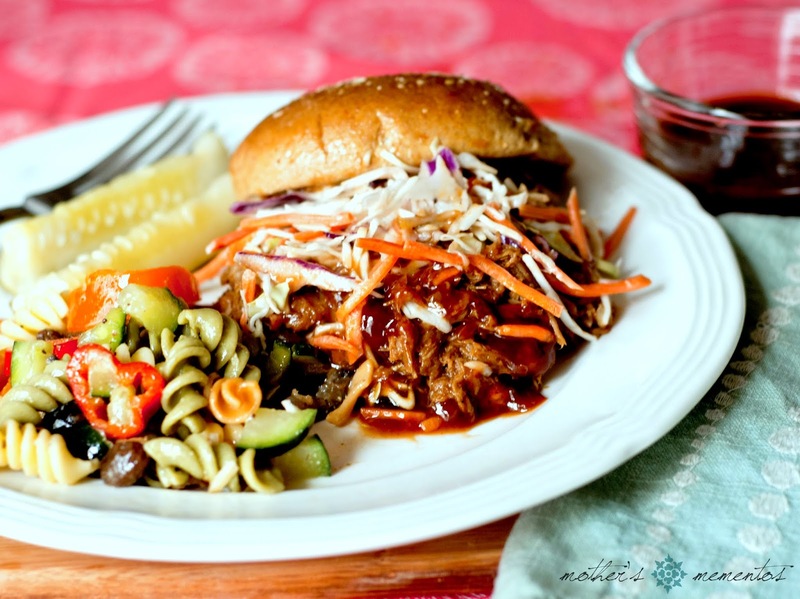 Once the sauce is done cooking, remove 1 cup of the sauce to reserve for serving along side the pulled pork sandwich. The remainder of the barbecue sauce will be used for cooking the pork. After pork is done cooking for 8 hours, remove meat and let cool. When pork is cool enough to handle, pull meat into thin shreds, removing all bone, fat, and gristle. Return pulled pork to slow cooker, stir in remaining barbecue sauce, and season with salt and pepper. Cook for 1 hour longer on low. Serve with hamburger buns and coleslaw. Junia - I pray that you'll be able to enjoy this one day soon! Marsha - We got a slow cooker for our wedding (that was almost 7 years ago), and I just started using it last year. I love it! It makes life so much easier. I throw a few ingredients in there after lunch, and then I don't have to worry about dinner. 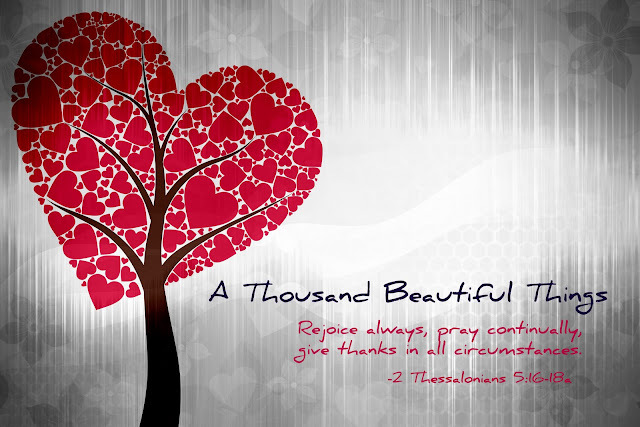 Hope you have a wonderful week as well!